This tree species was described in 1867 and is popularly known as “Guarajuba”. It is endemic to the state of Rio de Janeiro in Brazil, which forms part of the Atlantic Forest Biome. It grows at altitudes of approximately 100-200m, and on average reaches heights of 18m. During the twentieth century, it was exploited for its high-quality timber which was used to construct a wide range of commodities, including boats and houses. This exploitation has nearly decimated its population. 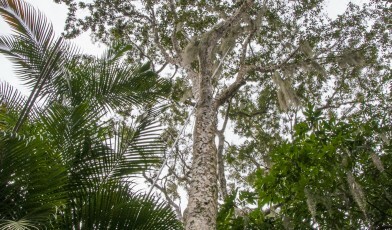 Until recently, this tree was considered Extinct in the Wild; the last record of the species in the wild dates from 1942, and the only known living individuals were those grown at Rio de Janeiro Botanic Garden. However, in 2015 the species was unexpectedly re-discovered in the wild, in the Rio de Janeiro municipality, where some sterile individuals were found growing in an Atlantic Forest Fragment near the Grumari beach. An 18m tall flowering individual was also found growing nearby in the garden of an elderly couple, again located in an Atlantic Forest Fragment. This finding was a big surprise even for the botanic specialists, who had been initially sceptical about the re-discovery. The specimens have been recognised as legitimate, and collections from the new population are currently held at the Rio de Janeiro Botanic Garden. This profile was written by Lucas Moraes, who also provided the species photo. Marquete, N. F. D. S., Teixeira, J., Valente, M. D. C. 2003. Terminalia L. (Combretaceae) na Região Sudeste do Brasil., Bradea.16: 99-123. Stace, C.A. 2010. Combretaceae. Flora Neotropica 107. New York, The New York Botanical Garden Press. 369p.